Ever suspect there’s an easier way? And in fact, almost no one does. 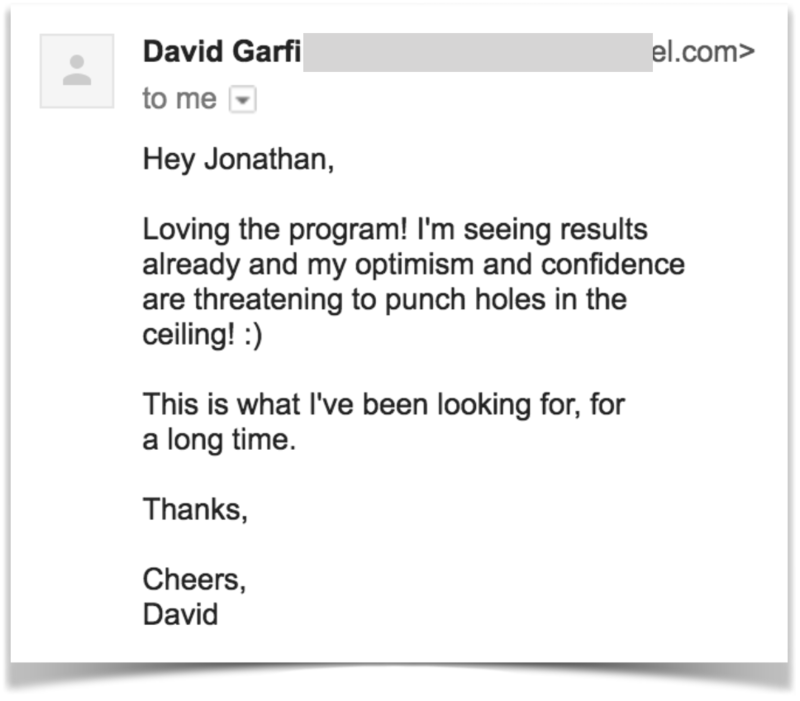 There are a few simple explanations that will save you the time and effort of “climbing that ladder” in the first place. Somehow, in books, “comprehensive courses”, and even in music schools, a concrete explanation of these concepts have managed to slip through the cracks – left for you to figure out on your own. In fact, I’ve never met a single student who could explain each concept directly and clearly. 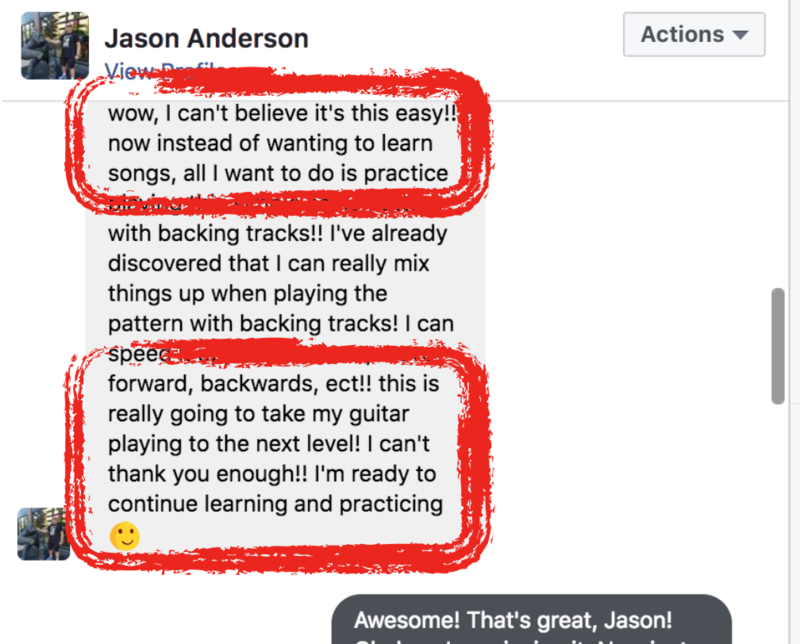 Yet a clear picture of these concepts can guard you against getting stuck, will answer many of your questions along your journey, and allow you to be more creative on guitar. When you know them, your understanding of music on guitar will deepen. Your progress will accelerate. And you’ll be able to move forward with more clarity and less confusion. I’ve laid out nine of these fundamental concepts below. At first glance, they may seem too simple – don’t be fooled. 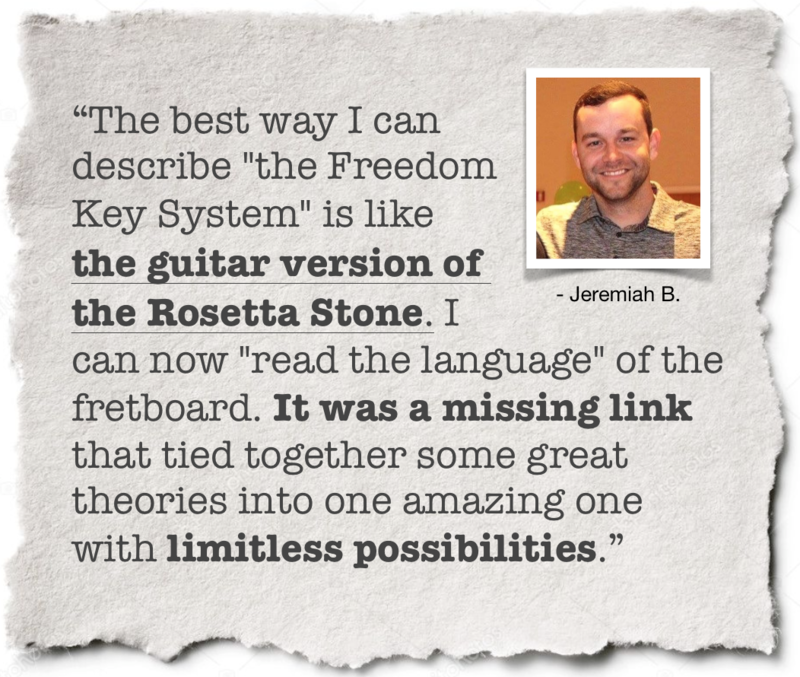 These are the foundational pillars of freedom on guitar. Do your best to answer each question yourself before reading further. I promise you will learn so much more if you do. Let’s see if you can pass the test. The term “pitch” refers to the “highness” or “lowness” of sound. The sound of a whistle has a high pitch. The sound of thunder has a low pitch. On your guitar, your low E string has a lower pitch than your high E string. When playing guitar, it’s essential to know which direction to move your hand to raise the pitch or lower the pitch of the notes you’re playing. 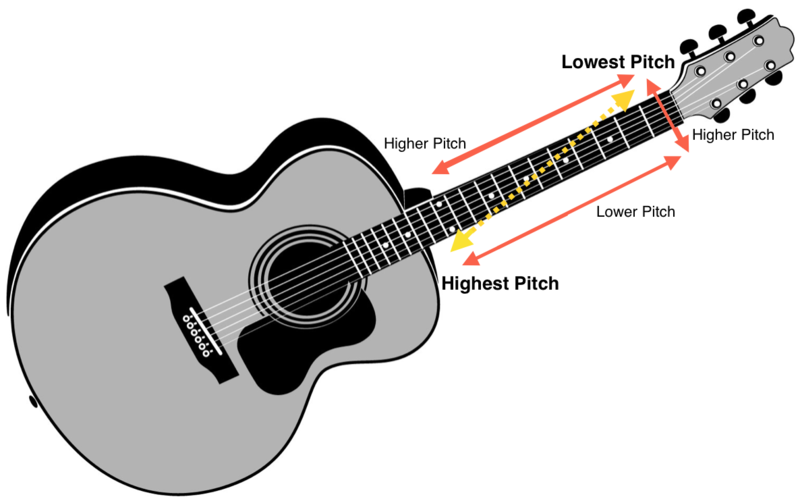 Take a moment and study the “pitch direction” guitar diagram below. A “note” is simply a single pitch. One sound. On guitar, we give these sounds names – A, B, C, etc. But instead of calling them “pitches”, we call them notes. If I asked you to play an “A note”, you would be playing one single pitch. A chord is a group of notes played at the same time. More specifically, a chord is “more than one pitch” played at the same time. When you strum a “G chord”, you’re playing multiple notes at the same time – making a chord. When more than one wind-chime sounds in a wind gust, it makes a chord. When two or more people sing at the same time, it makes a chord. When your neighbor is mowing his lawn and your other neighbor is blowing the leaves, the sounds of their equipment together makes a chord…although not a very pleasant one. What does sharp and flat mean? Sharp simply means “up”. Flat simply means “down”. More specifically for guitar, sharp means “up one fret” (up in pitch – toward your body). 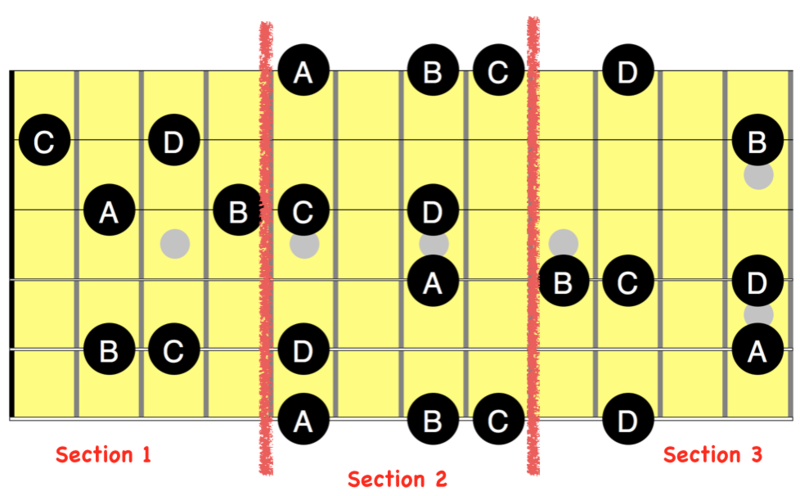 Flat means “down one fret” (down in pitch – away from your body). Sharp and flat (or sharps and flats) generally refer to notes – a note can be sharp or flat. We might tell someone to “sharp or flatten a note” if we wanted them to move the note up or down in pitch. What’s the difference between Major/Minor and Sharp/Flat? Major or minor and sharp or flat do not mean the same thing. Sharp and flat mean “up or down” and generally refer to notes. (Although you can “sharpen” or “flatten” an entire chord by moving it up or down by one fret). When you hear “sharp”, think higher pitch. When you hear “flat”, think lower pitch. Major and minor refer to chords. Not notes. Many people confuse “flat” with “minor”. But there is no such thing as a “minor note”. Only minor chords. Notes are sharp or flat. Chords are major or minor. What does major and minor mean? You can think of Major chords as sounding “happy”. Think of Minor chords as sounding “sad”. Arpeggio (pronounced ar-pezsh-ee-o) is just a fancy name for “the notes of a chord played one at a time”. You strum a chord. You pick an arpeggio. If you pick the notes in a chord one at a time, you are playing an “arpeggio”. In other words, you are “arpeggiating” that chord. At it’s most basic, a scale is “any series of notes played one after the other”. There are only 12 different notes (“letter notes”) on your guitar. If you play any combination of those 12 notes, one after the other – without repeating – you are playing a scale. It just so happens that some combinations of those 12 notes sound better than others. So we use them more often. By far, the Major Scale and the Pentatonic Scale are the most popular. Reread the last sentence again carefully. What is a scale again? A scale is a combination of notes played in series (or one after the other). Let’s say we pick notes A, B, C, D to be in our scale. If you play those notes in order, one after the other, you would have just played the “ABCD” scale (or any name you want to call it). Now, isn’t there more than one place to play an A note, B note, or C or D note on the guitar? Could you remember all that? Me either. So let’s make it easier. What if we divided the fretboard up into different sections? That way, we could just memorize one section at a time. There, now we have three different chunks or “patterns”. This is where “scale patterns” come from. You can slice and dice them any way you want. Any scale pattern you see is a result of dividing up the fretboard into smaller parts. The pattern itself is not what makes it a “scale”. The scale is notes A B C D – not a pattern. Why do we use patterns? Because they are easier to memorize and convenient to play. In our example, we created three scale patterns. 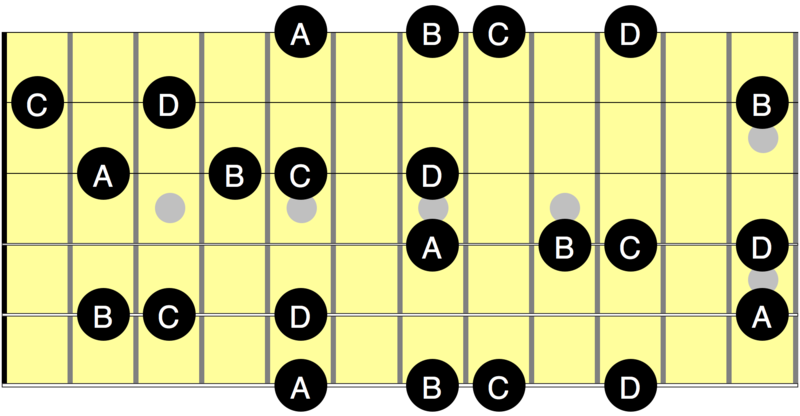 If you memorized all three patterns, you could play “the ABCD scale” everywhere on your guitar neck. This is exactly how your favorite guitar players can play anywhere all over the guitar and still sound good – even with their eyes closed. 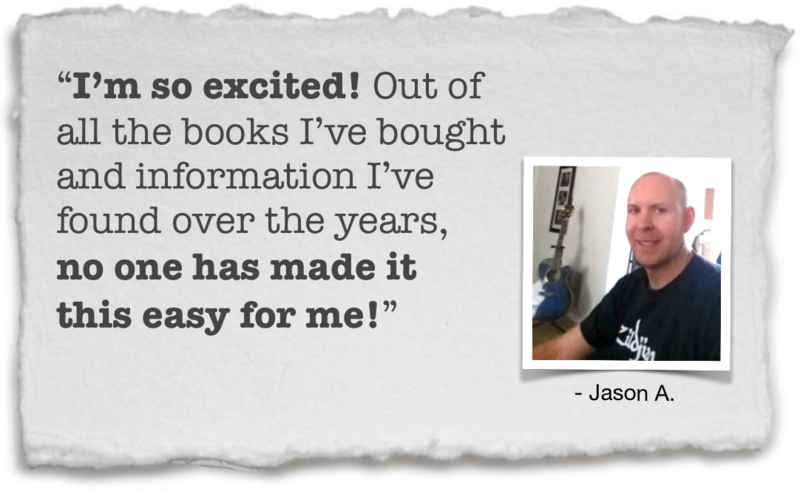 If you want to learn more about how to do this, click here to get your free soloing training. Again, please reread the last sentence carefully. Put differently, the “shape” of a G chord is not what makes it a G chord. What is a chord? A chord is a group of notes played at the same time. Let’s make a chord. Say we pick notes A C and E. Of course, we just discovered that notes can be played in more than one place on the fretboard. So let’s see where. Looks messy doesn’t it? Let’s make it easier. 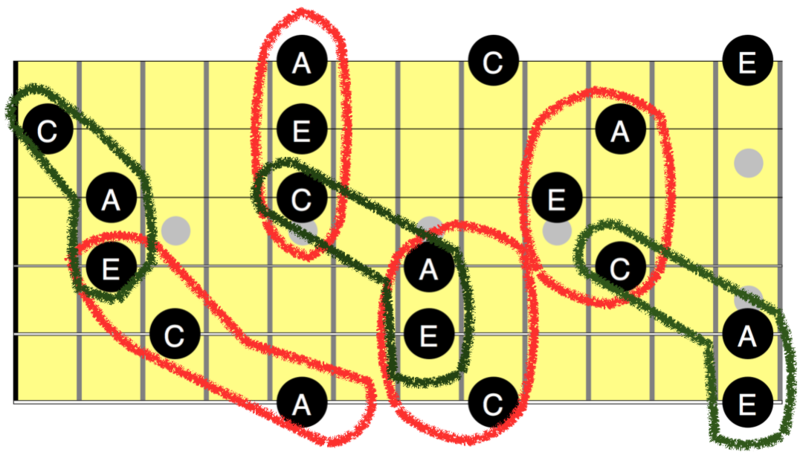 We know we need to play the notes A C E to make the chord, so I’ll circle every place you could possibly play notes A C and E at the same time on the fretboard. Do you notice how each chord has a different “shape”? I’ve left one chord shape un-circled. Can you find it? Why do we learn chord shapes? Because it’s much easier to memorize one or two “shapes” rather than trying to remember where all the A C and E notes are on the fretboard. As you can see, the shapes do not define the chord. The shapes are a result of grouping together the notes in the chord. Chords are defined by the notes that make them up. 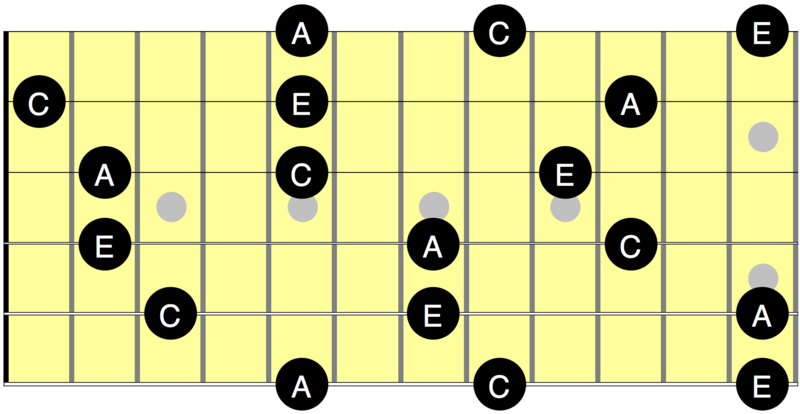 Then chord shapes are created based on where those notes are on the fretboard. Why are the open chords G, C, D, etc. so popular? Because they’re easy to play and they sound good! But as you just learned, there are plenty more places on the fretboard to play those same chords. This explains how guitar players can play the same chord in many different locations on their guitar neck. Now you know how. At first, these explanations may seem obvious – even too basic. However, without them, you’d have a tough time “glueing” everything you learn together. All music is really just the same few fundamental principles presented in different ways. These concepts are the basics of the system from which all popular music is created. If some of the concepts don’t entirely make sense right now, that’s ok. 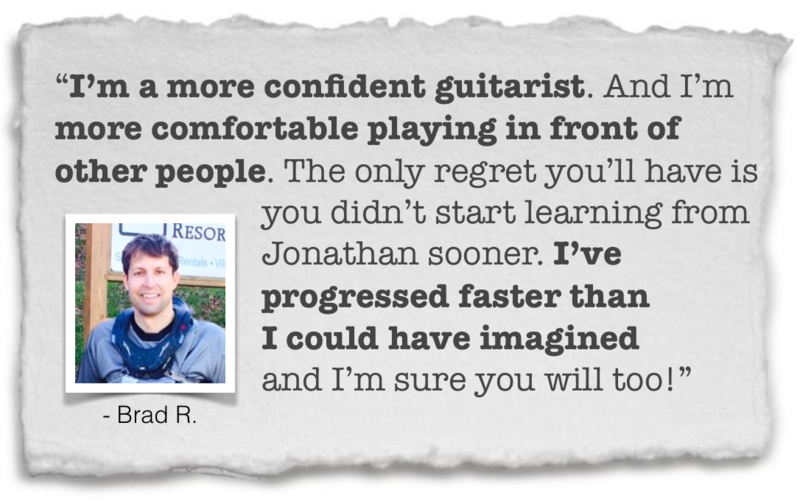 The picture will become clearer as you continue to learn and discover new things on guitar. I suggest reminding yourself of these concepts often. Did you know all these ideas before reading? What did you learn? Share your discovery in a comment. If you know a friend who would benefit from this, share it with them. Feel free to share it with your Facebook friends and Twitter followers as well. I have to say this is the most clear way to explain the guitar…i am 43 years old and have played guitar since I was about 15, but never could get better because i couldnt put it all together. This is spot on!!!! That’s great to hear, Lamar! Glad I can help you. What else would you like to know more about?